Republicans may soon lose a key talking point. According to data released Thursday, President Obama may now be a net job creator. 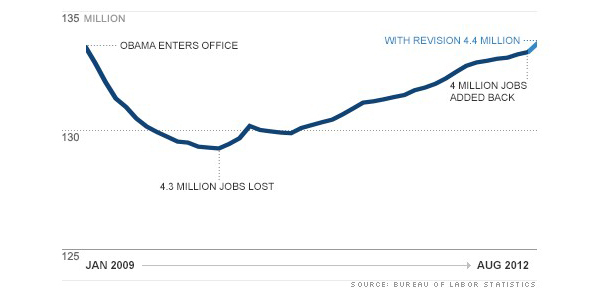 In the year following Obama's inauguration, the U.S. economy lost about 4.3 million jobs. But new figures released Thursday show 4.4 million jobs have been added back since then. Here's how it happened: Since early 2010, jobs have slowly been trickling back, particularly in professional services, health care and manufacturing. As of August, the Labor Department had indicated about 4 million jobs had been recovered overall. Those figures get revised frequently though, as the Labor Department gets more complete data over time. On Thursday, the Labor Department released a statement, saying it crunched the numbers again, using unemployment insurance records that employers are required to file. Based on that data, the government now believes it under-counted jobs created in much of 2011 by around 386,000. That's according to preliminary figures that the government could still tweak slightly in February. If true, those figures mean the economy has recovered 4.4 million jobs since early 2010 -- enough to fully account for the jobs lost in Obama's first term. In fact, Obama would be ahead by exactly 125,000 jobs. The President is unlikely to brag about that on the campaign trail though. In a blog post Thursday, his top economic adviser in the White House, Alan Krueger, said the new data shows "the jobs recovery over the last 2.5 years has been a bit stronger than initially reported, although much work remains to be done to return to full employment." Meanwhile, Republican nominee Mitt Romney still has plenty of fodder to criticize Obama on economic issues. "President Obama's administration promised, with the passage of the stimulus, that unemployment would currently be at 5.4% with 9 million more people working," Romney campaign spokeswoman Andrea Saul said in a statement, referring to a 2009 report by Obama's then chief economic adviser, Christina Romer. "With unemployment at 8% or higher for the 43rd consecutive month and 23 million Americans struggling for work, President Obama's policies have failed miserably by his own standards," Saul added. Given that the jobs decline started before Obama entered office, employment is still far below 2007 levels. Hiring has barely been strong enough to keep up with population growth, and that's why the unemployment rate is still stuck at 8.1%. A survey of households shows the U.S. population has grown 3.8% since Obama entered office, but jobs have only grown by 1.5% over that same time period. About 12.5 million Americans were still counted as unemployed in August.